DEPECHE MODE...."Painkiller" (Kill the Pain mix) MUTE-DJ Shadow vs. Depeche Mode B-Side 12"-6:31 UK Lacquer from THE EXCHANGE MASTERING 1-sided 12" Acetate, Lacquer, Dub Plate in custom sleeve from the Exchange with letter!!! (See Photos) NEAR MINT CONDITION DISC...close to Flawless. 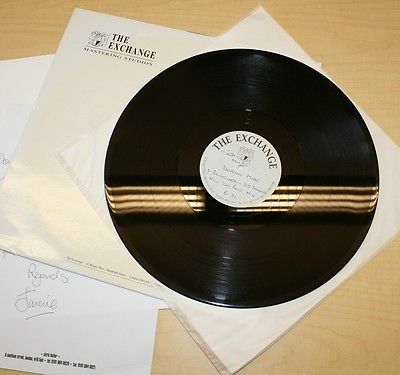 This isan Ultra-rare 1-sided 12" THE EXCHANGE Mastering UK acetate in custom slip cover with signed letter. Disk is in Near Mint condition (see description below on acetates). The track is as follows: "PAIN KILLER" (Kill the Pain Mix) remix by DJ Shadow in 45 RPM. Top Quality, Super Thick lacquer in close to flawless condition. Onlya fewof these discs were ever produced. This disc has nice shiny surfaces on both sides (front and back-see pictures). I amVERY particular (check my feedback) and this is not like the trashed acetates you see so many of that are almost dull in finish from having been played like a record over and over. I have stored this disc out of the light in a protective sleeve and in a smoke-free environment. Each acetate is unique (see comments on acetates below).Don't miss out on this rare opportunity to obtain an amazing acetate.This is also guaranteed to be authentic and not one of the many "fakes" being produced in Texas and elsewhere and sold on Ebay these days. "Acetates: Aluminum discs of various sizes (7, 10 or 12 inch) with a thin coating of shellac or vinyl. These discs are not pressed like regular vinyl issues. Instead, they are INDIVIDUALLY cut by the master cutter as a "pre" test pressing to give directions as to how the final cut should go. As such, EACH acetate is unique, and acetates constitute some of the rarest items in the whole field of record collecting." Additional information on "Acetates" obtained from a UK seller's description on their site. "Acetate/LacquerIs usually a reference cut that is made on ultra high-grad methyl cellulose sprayed onto thick aluminum discs. Reference acetates are primarily to make certain the record will sound somewhat like the tape. Often they are also made to allow a club or radio disc-jockey to play the music on turntables before it has been pressed as a normal record. Acetate is a misnomer (but frequently used!). It is actually a Lacquer." OUTSIDE OF USA & CANADA SHIPPING IS $25.00.